As you can see, Masha and Colin, are a stunning couple - inside and out! Masha is an incredibly talented watercolor illustrator who has a thriving business. Her fiance, Colin, works as both a male model and an actor. While planning the engagement shoot, we really wanted their spirit and personalities portrayed, so one of the first elements created was the Save-the-Date by Masha. She created a stunning invite that's colorful and whimsical, giving both us and their upcoming marriage great inspiration. 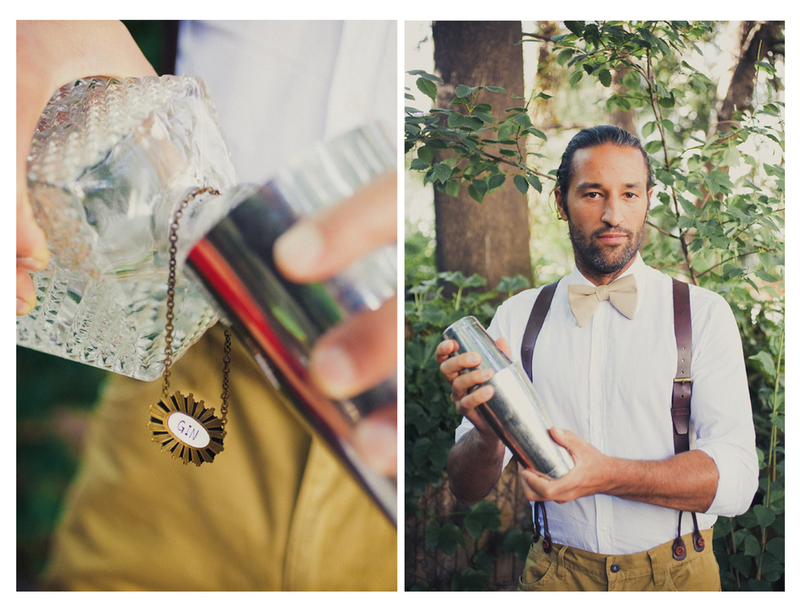 added in a specialty cocktail that Colin could make and serve to his lovely fiance as part of their intimate celebration of their engagement. Jenna and I were inspired by vintage, one of a kind pieces found in local Brooklyn thrift stores. 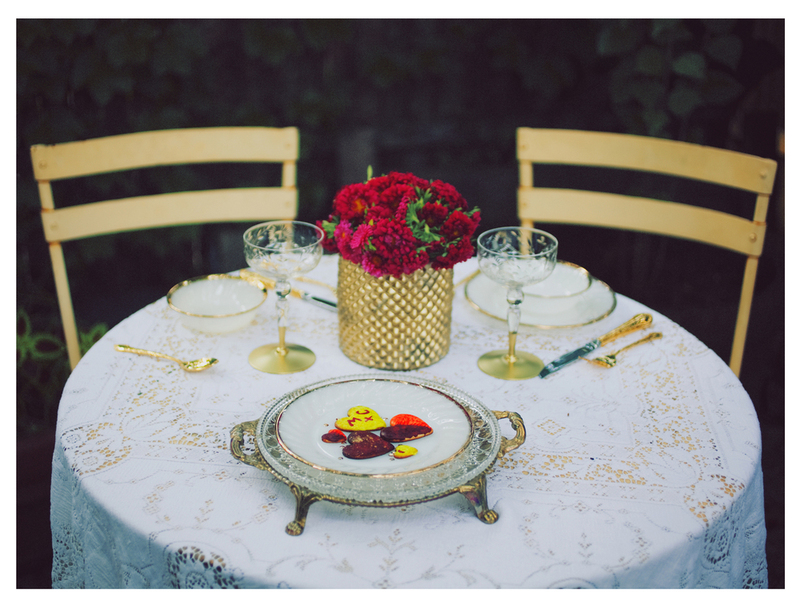 We had so much fun gathering glass wear, cocktail trinkets and borrowed table linens to implement our vision for the garden table scape. Pomegranates have such great color as well as being a perfect compliment to St.Germain, so we built upon the flavor palette until we came up with the perfect recipe for their "Love Potion". The Pellegrino was a wonderful addition, it makes the pomegranates float! I created two gorgeous headpieces for Masha to wear - one for the initial cocktail scene, as well as a gold hand beaded headband for the second scene. Masha is a self proclaimed fashion maven, so we sourced from her personal closet since we wanted to capture the couple and showcase their style. Colin's clothing also came from his personal closet, we loved that navy blue blazer! Kelly of 2H Flowers went with strong, bold colors for the arrangements. Creating simple bouquets that had a pop of color, it worked perfectly with the table scape that was accented with gold (red gomphrena and red aster). Kelly & Jenna also created a wonderful flag bunting with carnations spray painted in gold for the backdrop of the bar supplies shot. Colins boutonniere needed to be interesting but not fussy, so Kelly used a combination of dusty miller, red gomphrena, and silver brunia. Morgan, our makeup artist, started off with a dewy soft, complexion to pair with that bold red dress. As we moved through the afternoon she added more details to create a stronger look, using purple to line her bottom lash lines in the second scene and then a mulberry lip color for the final scene right before they go "out on the town". Amber's photographic eye helped bring together all of the elements of the day into one lovely shoot! She captured both the playfulness of the couples personality, as well as their chic style, which she collaborated on styling with Masha for the shoot. Her ability to both direct the couple and tell a story really comes through in the images. 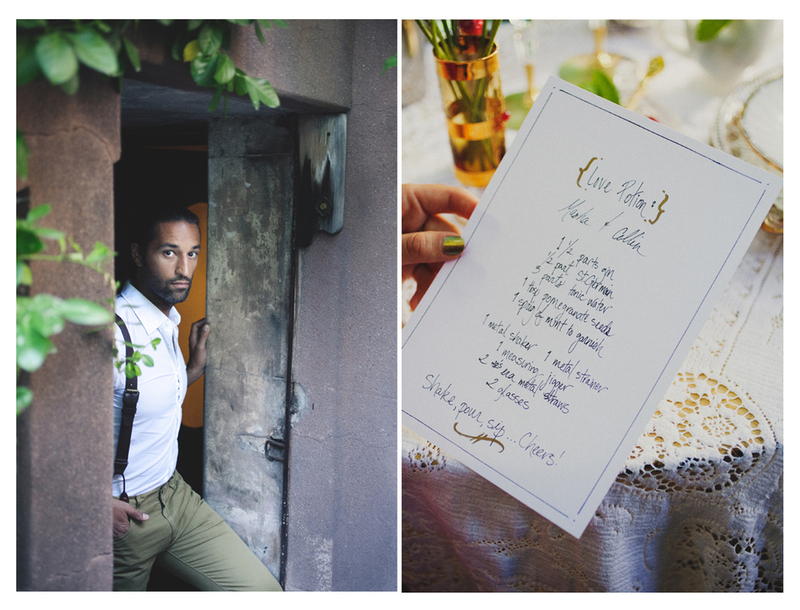 Our setting couldn't have been more perfect for what we needed and it is all in thanks to Rachel, who graciously allowed us to use her brownstone and shoot in her back yard! As a team, we were so delighted to hear from Masha and Colin after the shoot, conveying their enjoyment with the layout and personal attention each of us paid to making it feel like a shoot that reflected them.